This website is being published in conjunction with the Victorian Parliamentary Inquiry 2012 into the handling, by religious organisations, of reports of sexual and other abuse of children. It appears, now that the Inquiry is well underway that the main emphasis is on THE CATHOLIC CHURCH as the worst offender with the Victoria Police slamming the Archdiocese of Melbourne accusing it of impeding police investigations and COVER UP. Below is a summary of part of my story as told to the Inquiry. Twice now since 2005, I have approached the Catholic Church "Melbourne Response" (for reporting abuses committed in the Archdiocese of Melbourne,) asking them to hear my complaint against the Pastorelle Sisters for ABDUCTION and for TRAFFICKING me into religious servitude as a child. * At the time, the Pastorelle Sisters, three of them in particular, apart from and outside of their institutional lives, were engaged in "a work of the apostolate", under contract and with financial arrangements in place, running a parish Hostel for Dr. Percy Jones, Parish Priest of Carlton, under the auspices of Archbishop Dr. Daniel Mannix of Melbourne. The Pastorelle Sisters had been invited into the Archdiocese of Melbourne to undertake running a Hostel for displaced Italian young women migrants. They arrived from Italy at Port Melbourne on the ship "Flaminia" in 1955 and were met by a contingent of priests representing the Archbishop. The Pastorelle Sisters fill all criteria for being under the authority of the Archbishop of Melbourne at the time they stole me from my mother, from my country, took away my liberty, my human rights, my nationality, destroyed my whole life and future and caused my mother to lose her mind.
" I have no jurisdiction over religious orders." Mr. O'Callaghan seems not to comprehend that the Pastorelle's Sisters work in parishes where they have been invited by the Bishops to carry out whatever works of the apostolate are required, thus placing the sis ters,in accordance with Canon Law, under contract to and under the jurisdiction of diocesan Bishops. They also receive, in accordance with Canon Law,financial remunerations for their work. Either Mr. O' Callaghan has failed to comprehend this or he has been telling me ..
Mr. O'Callaghan DOES have jurisdiction over these religious because the Pastorelle Sisters were, at the time they stole me from my mother, under the authority of the Bishop because they were carrying out work in the apostolate running the parish Hostel where I was boarding. The Carlton Hostel was a work of the apostolate! For as long as those nuns were under the jurisdiction of the Bishop and I was an Australian Citizen, their candidate from the Hostel in that parish, then they were responsible and answerable for anything that happened to me...especially since they broke the law in my regard stealing me from my mother in the first instance. ii CAN. 678-1 " In matters concerning the care of souls, the public exercise of divine worship and other works of the apostolate, religious are subject to the authority of Bishops whom they are bound to treat with sincere obedience and reverence..."
CAN. 681-1 " Works which the diocesan bishop entrusts to religious are under the authority and direction of the Bishop without prejudice to the rights of religious superiors. CAN-2 "In these cases a written agreement is to be made between the diocesan Bishop and the competent religious superior of the institute, this agreement must express and accurately define, among other things, the work to be done, the members to be assigned to it and the financial arrangements." 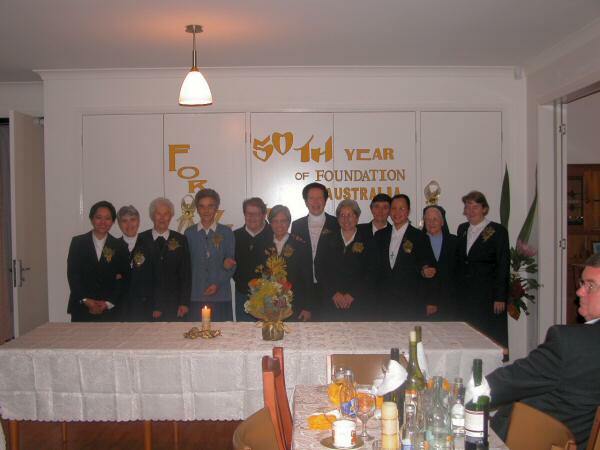 In 2008, The Pastorelle Sisters' historical account of their 50 years working in Australia was published. "Building Community" was hailed by retired Auxiliary Bishop of Melbourne Joseph Patrick O'Connel as: " ..a completely professional account...". Compiled from interviews of the nuns, the book is authored by Annamaria Davine- honorary historian from the School of Historical Studies at Melbourne University. GO TO: "About Me Yesterday and Today" (above) to read an Open Letter to the Pastorelle Sisters' current Congergational Leader Sr. Mary La Bruna. I knew this woman as a 17 yr old girl wanting to become a Pastorelle Sister. She was once my friend but now that I am revealing the TRUTH...which Archbishop Denis Hart proclaims the church will face, with "nothing to hide", it seems my former friends have been silenced. 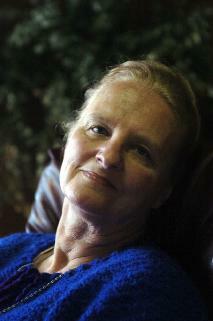 * Was Annamaria Davine (author) aware of the lies and half-truths she was being told? * Was she complicit in doctoring timelines, dates, events and the comings and goings of people in this account so to EXPUNGE my existence from among the Pastorelle Sisters in Australia? The Pastorelle Sisters stole my life, they violated the laws of my country to steal me as their first Australian recruit. With their so-called "completely professional account of recent history" (FOREWORD of "Building Community"),they have EXPUNGED me from their records. It is as if I never existed! To admit to having taken, from their parish Hostel in Carlton, in 1959-60, an Anglo-Australian schoolgirl of 16 and to have sent her to Italy as a recruit to religious life, would have meant telling many more lies to COVER-UP the illegality and intent of their actions. * skip over the details and, in their book 'Building Community" about their work in Australia, they blend the Australian girl in with others they call 'Local girls" who joined years later and who had come from the Philipines. it is not only dishonest and underhanded but hurtful, abusive and very just plain nasty to erase me like that after what they did! * and then BLAME the woman for being disagreeable and non compliant....with all their charitable "pastoral responses"! They wanted a mediator who was familiar with their "culture", who would make excuses for their actions on the grounds that it was their tradition etc....abducting young girls, forcing them into religious life and subjecting them to all manner of abuses? To make it all worse - the "Melbourne Response" refuses to hear my complaint against The Pastorelle Sisters, and continues with smokescreens. "That they have made of you a non-nun, written you out of their records, is a most enormous obscenity piled upon all the rest!" 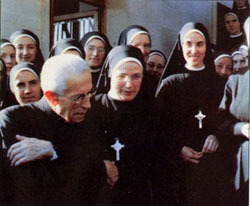 Original Hostel sisters - The one in blue- Sr. Tarcisia Claretta Magarotto, the one at her right- Sr. Letizia Antonietta Selle, at end -second from right, wearing veil- Sr. Cesarina Lola Paolini, and 5th from left, the former superior at 200 Smith Street Thornbury 1966 - Sr. Emma Giulia Luigia Cuffolo. She'd sent me out of the convent to hand deliver a message to a priest and to a girl at their homes. Displeased with the result on my return... she punched me in the face and broke my nose. 2003 - Towards Healing Director of professional Standards, Howard Murray refused to hear my case stating that a punch in the face and a broken nose..
One day I will be able to say that I was molested by a Saint when I was pure and virginal. I was too ashamed to marry. I could not have children. Why does the church reward him ?